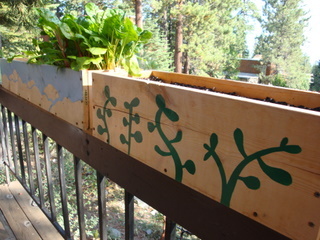 So I’ve been meaning to stencil the backside of our planters all summer long, but just got around to it today. I always cringe when imagining our neighbors looking at that plain wood (while such a good view greets us daily). I went with a jade/manzanita inspired design to match the foliage under our deck. My first “test” design (pictured above) came out pretty well, but I’ll perfect it a bit before moving on to the larger planters. Though I’m happy to tick this off my craft to-do list, I am running out of wood to stencil. Wonder what our landlord would think of some wall art?